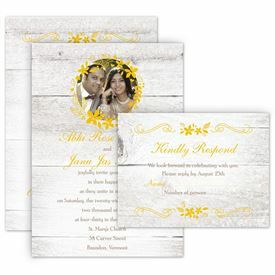 Boho wedding invitations from Ann's Bridal Bargains are the perfect way to introduce your Bohemian style. A sweet, whimsical style filled with lush floral patterns and natural motifs, the Bohemian look fits beautifully into today's world of weddings. Take a look through this vast collection of affordable boho wedding invitations featuring unforgettable artwork. You're bound to find the right colors and styles to introduce the look you want to achieve, all for a price you never thought possible. Have you looked at our vintage wedding invitations? Vintage designs are another great option for achieving that trendy boho look, and they're just as affordable!